Looking for a unique location for your next conference, team-building, or staff social event? With secluded bays and beaches, breath-taking views and an array of history, Rottnest Island is an iconic location for a day out. 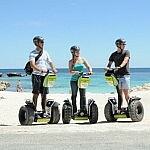 Cycle around, book a tour, or hold a luncheon and enjoy the stunning location that is Rottnest Island. the ultimate beachside backdrop we believe you will find it hard not to refocus, revitalise and relax! The newly refurbished Dining Room is tastefully appointed with its own exclusive veranda and private bar. Perfect for dinners, lunches, small celebrations, business meetings or an intimate cocktail party. Recently refurbished the Board Room is fully equipped for meetings, small conferences, or training days with French doors opening to an outside covered patio with excellent views. With dazzling views over the Ocean our stylishly designed marquee can dressed for all occasions, from conference set up to a themed party, dinner or product launch. A private bar within the marquee can service your guests. The Rottnest Island Country Club, renovated in 2013, is conveniently located 10 minutes walk from the Thompson Bay settlement area, yet provides a sense of seclusion and tranquillity. The RICC provides a pleasant alternative to the busy conference settings of the mainland, with a fully equipped and licensed function centre and stunning views over Rottnest Island’s 9-hole golf course. In addition to the Country Club’s conference facilities and golf course, the venue also offers a lawn bowls green, spacious club room, outdoor seating area and two barbeques, making it suitable for a wide range of corporate packages. A more affordable, accessible, and unique midweek meeting and conference venue you will not find! 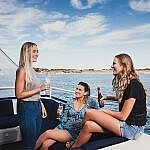 Just a short 45 minute ferry ride from Hillarys, Rottnest Lodge is growing in stature as a great CBD alternative for meeting and conference organisers. The largest accommodation provider on Rottnest Island, Rottnest Lodge can comfortably host groups of up to 110 in its fully equipped conference facilities. New and improved additions to the property including the fabulous new Mediterranean inspired restaurant, Riva, featuring the newly introduced wood fired pizza oven, refreshed and refined wine list offers limitless catering options for corporate groups. A menu of out of session activities including but not limited to movie screenings, bike tours, golf, wine tastings and sunset cruises enables event organisers working with our experience team to create interesting and entertaining itineraries for any sized group. Why worry about traffic and parking when our bus drivers can do it for you? 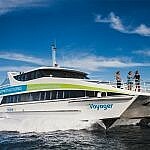 Rottnest Fast Ferries operates an airconditioned, complimentary coach service so you can relax with a drink at Rottnest Island or unwind at Hillarys Boat Harbour upon your return. For passengers who make their own way to the terminal Hillarys Boat Harbour offers free car parking, patrolled by security. 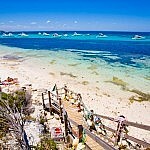 Grand Island Tour: This 3.5-hour all-inclusive island tour includes all of Rottnest’s must see locations including the Wadjemup Lighthouse, Henrietta Rocks, Oliver Hill Gun Fortification and Tunnels and the majestic look-out point at the rugged Cathedral Rocks and Cape Vlamingh. 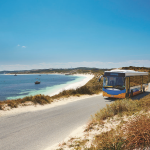 Rottnest Discovery Bus Tour: This 90 minute commentated tour of Rottnest Island will take you from the Settlement area to breath-taking West End. Enjoy fun facts about the island, including its history, development, and flora & fauna. Train and Tunnel Tour: Interested in Rottnest Island’s involvement in World War II? Embark on this two-hour tour up to Oliver Hill Lookout, where you can explore the island’s wartime tunnels, defence system and 9.2inch guns. Coastal Cruise: Our 1.5 hour Coastal Cruise travels along the beautiful Sunset Coast allowing you to enjoy the view of the Indian Ocean. Whale Watching: From September to November thousands of Humpback Whales embark on their annual migration along Western Australia’s ‘Humpback Highway’. The playful and majestic nature of these creates provides for the experience of a lifetime! Enjoy Rottnest at your own pace, and explore the beautiful underwater sights that the island has to offer with our bikes and snorkelling sets. Available to hire from Hillarys Boat Harbour, you can collect your equipment before you depart, saving you precious time on Rottnest. Hotel Rottnest: Boasting stunning views overlooking Thompson Bay the Hotel offers a range of lunch and drinks packages, perfect for group outings. Karma Rottnest: In addition to its conference rooms and accommodation facilities there is the Lodge’s Mediterranean-inspired restaurant, Riva. With a choice of an a-la-carte menu or a buffet style lunch, the Lodge can cater to a range of dietary needs and preferences. Our vessels are fully-licensed, serving a variety of beers and wine on board.